I'm in-between trips at the moment, and finally found some time to blog - finally! While I'm busy as can be this month, I'm never too busy to share my current obsessions! I've been excited to talk about one of my newly found (and newly favorite) Midwest brands, Flyover Press. Flyover Press is a Midwest-inspired apparel and home decor brand that launched in April. All of their products are made in the USA and are inspired by the people, places and culture of the Midwest. Being a born-and-raised Midwesterner, it's no surprise why I'm beginning to love this brand. One of my favorite pieces of theirs is the Patriotic Midwest Tank in navy. This tank is perfect for a day at the lake, an evening by the grill or a weekend at a summer music festival (which is where I'll be wearing mine!) But I've gotta say, the best part in my opinion is the corn and wheat logo. Adorably Midwest. Next on my list are my good 'ole Ray Bans. It's finally sunny and (mostly) warm in Minneapolis, and I haven't been going anywhere without my favorite sunnies in my hand. Because it's finally been warm, doing my hair for work has not been my favorite thing to do. Even with shorter hair (I recently cut about 7 inches off! ), my hair is still taking far too long to blow dry, in my opinion. But my new full volume blow dryer by John Freida legitimately cuts my drying time in half. I'm not sure how I've lived so long without this baby. So with all of the business travel I've been doing lately, I realized that I didn't have a professional bag that could carry my laptop and all my purse essentials. So, true to my nature, I went shopping...and found that finding a bag to meet my needs was not easy! Luckily, Minneapolis is only a 45 minute drive to the Albertville Outlet Mall, where I was able to pick up a lovely leather Coach purse, similar to the one below. But buying it at the outlet mall meant I got it for a steal of the original cost, and it's a piece I'll have for years to come. Finally, with all of the traveling I've been (and will be) doing through the rest of the month, it seems I haven't been going anywhere without Starbucks in my hand. Caffeine is the name of the game this month, gems. 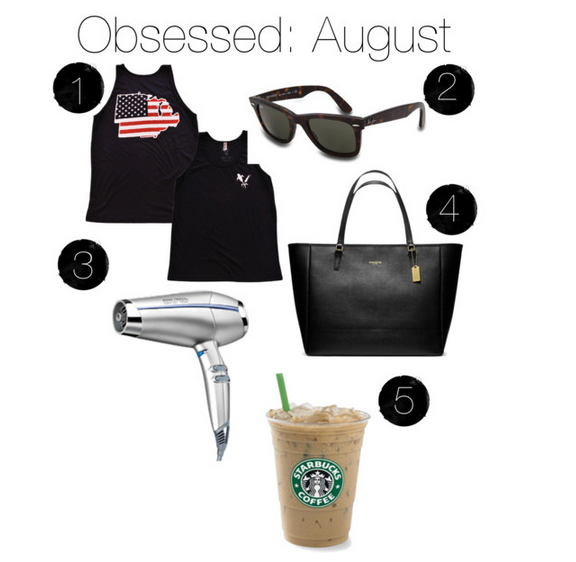 So tell me, loves, what are you obsessing over this month?